For the Volkswagen award ceremony corporate hospitality event. 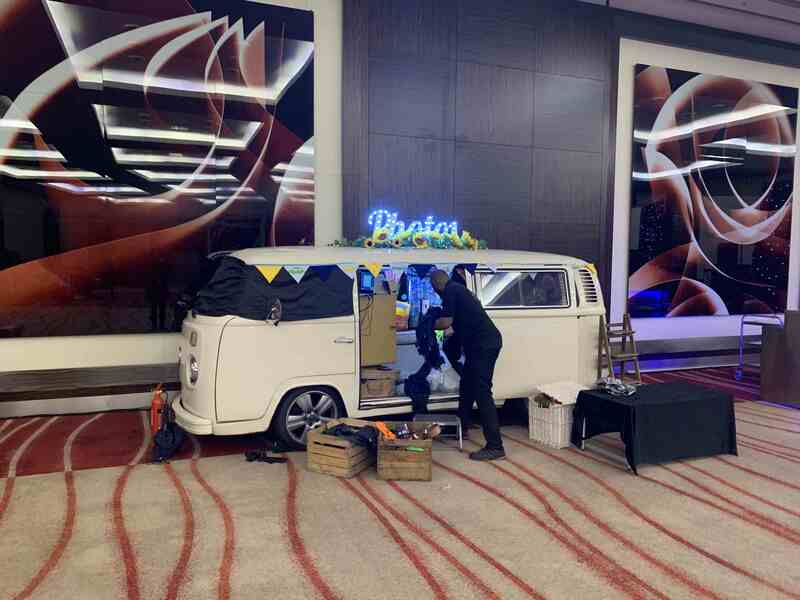 The thing I love about our business is the wide range of events that we get to work at with our campervan photobooth… however, when VW themselves contacted us to book a Campervan photobooth for corporate hospitality event in London, I really did get excited. What an honour to have the very brand that we have based or business on, contact you for your services! 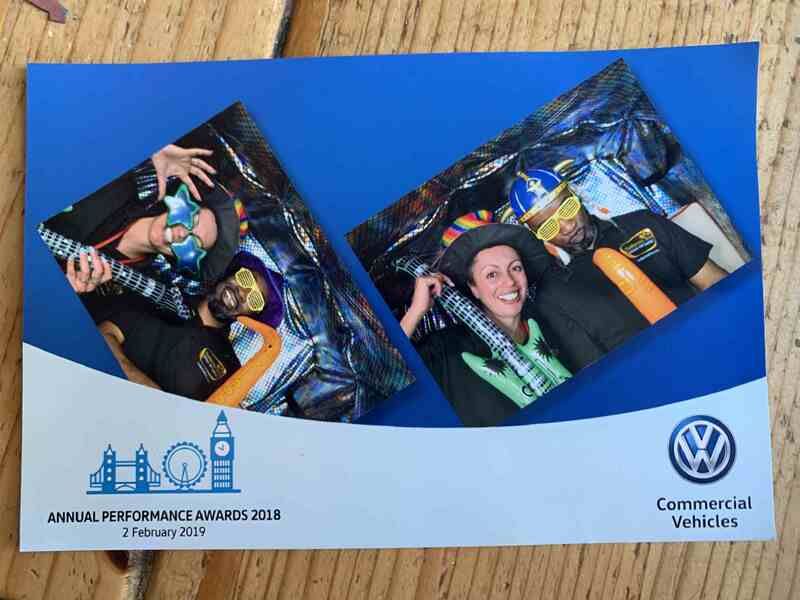 Volkswagen were hosting an awards ceremony at the Westminster Plaza hotel in London, and they wanted our campervan photobooth services as part of the corporate hospitality. This was going to be an indoor event. We are used to providing the risk assessments and are used to the additional work entailed to enable the venue health an safety officer to sign-off access. 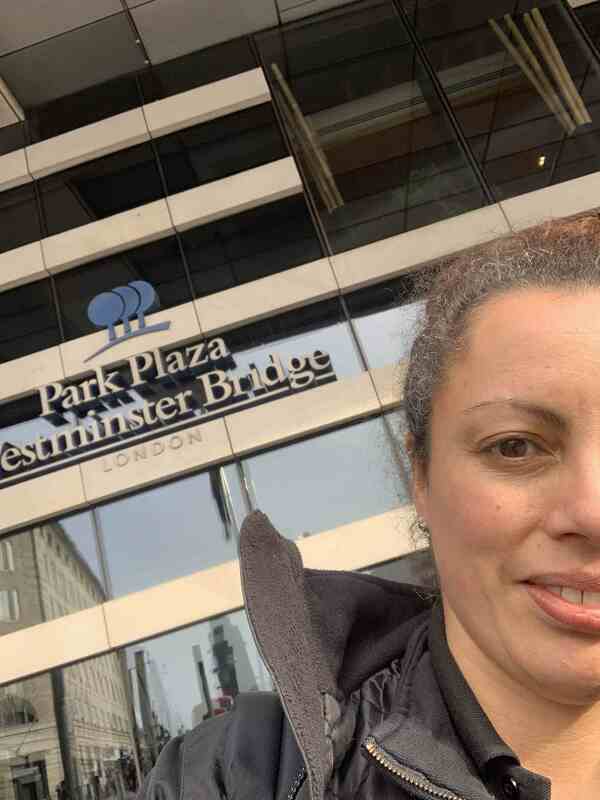 Following engagement with the H&S officer at the Westminster Plaza hotel, and a read through their poilcies regarding vehicle access, we scheduled an onsite risk assessment. Yes, that’s me in the picture below, snapping a quick selfie outside the venue (with rather a lot of grey hair showing!). We checked access routes, security check-in procedures and ID requirements. One of the key things to note was that the tank of petrol in the campervan needed to be certified empty (with time left for it to be vented before access to could granted). This would mean that we needed our transporter service so that we could prepare the campervan at our base, and then transport it with the empty tank to the venue. 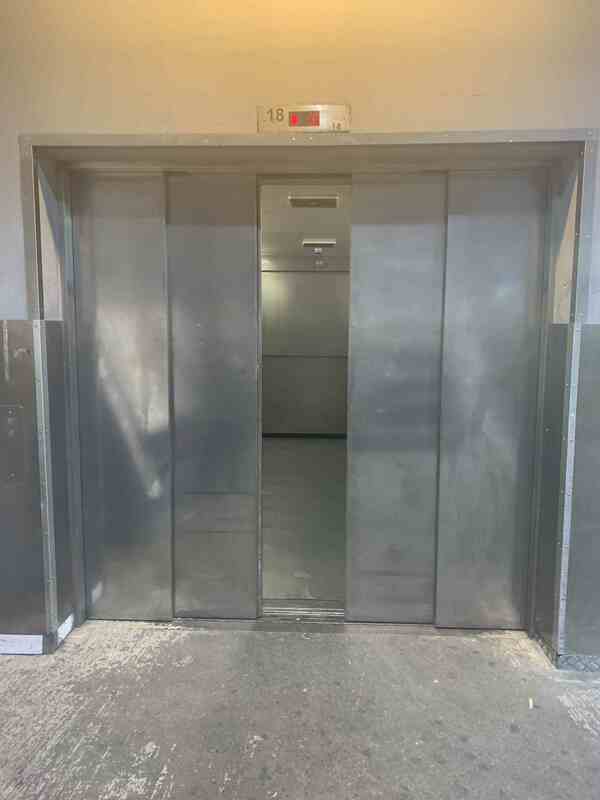 We assessed for accessabiity for both the transporter and the campervan – and came across the lift that we needed to push the campervan into to access the ballroom where the event would take place. That needed measuring, and checking that it was suitable for the purpose. Everything was fine – but manually pushing the campervan around a very tight corner to gain lift access was going to be challenging. Once we assessed the actual ball room, we confirmed the set-up position, power points etc. This was all documented in our report, so that it could be risk assessed and prepared for with the corresponding, detailed method statement. On the day of the event, we set off in good time to account for the unpredictability of London traffic. 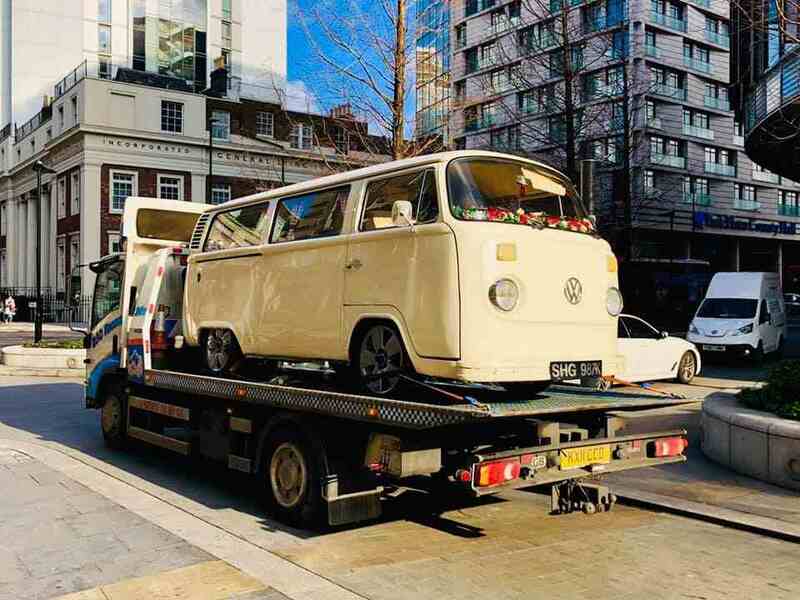 On this occaision we outsourced the transporter service to D&C Recovery, making use of their flatbed system to accomodate Pushka the campervan’s low suspension. Here she is, hitching a lift! Once we managed all the intial ID checks, and gained access, we worked as a team to get the campervan off the transporter and pushed (with a lot of effort!) into the lift. That’s me sitting behind the campervan wheel along with one of our team sporting one of our high visibility jackets! Once we had pushed the campervan out of the lift, and into the ball room, we needed to set it up on location. We were mindful of the additional steps we needed to take when working at an indoor venue – to include the disconnection of the battery, drip tray, fire extinguishers, chocs, cable mats…. and so the list goes on! For this particular event, we were providing a classic campervan service complete with custom branded instant prints and real time online sharing of the images via Twitter, Email and SMS. The campervan photobooth was a HUGE hit – with heavy usage all evening. We were working alongside a fantastic live band and an impressive lights and sound set up. 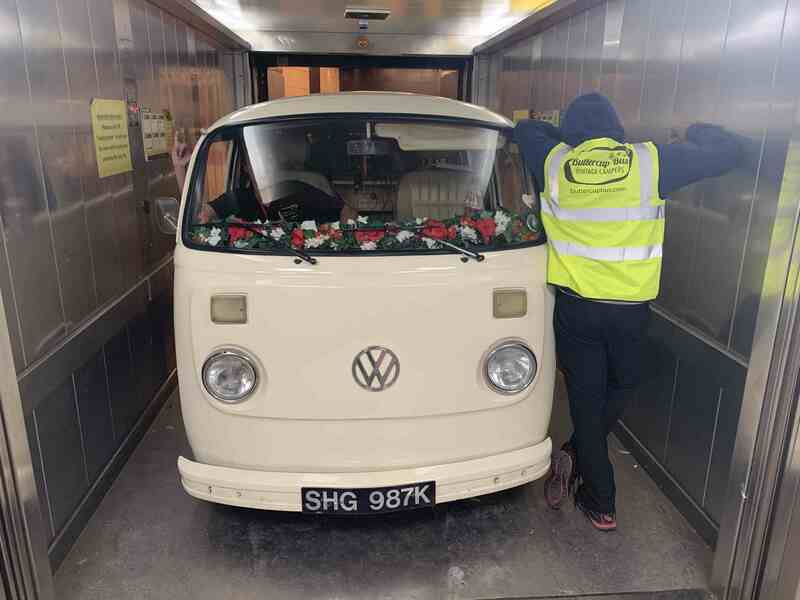 Packing up and departure was an involved process at the end of the evening, as we reversed the health and safety requirements – finalising with us pushing the campervan out of the ball room, back into the lift and out into the service area. One of our team needed to head back to our base to collect our support vehicle with petrol on board, so that we could get enough fuel in the campervan to get it started, and off site before filling her with enough fuel to get back to our base. 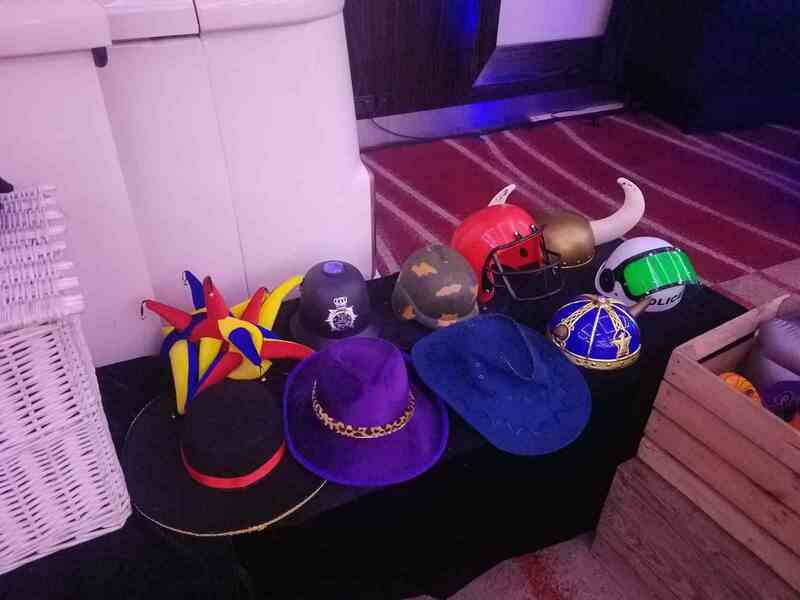 I’m delighted with how the evening went – based on our previous experience at working at indoor events, and our meticulous planning and paperwork, the event ran smoothly – and the Health and Safety officer said that we were really easy to work with, and that everything was delivered to a high standard. Yep – we will take that credit, and even give ourselves a little pat on the back! Ha ha! 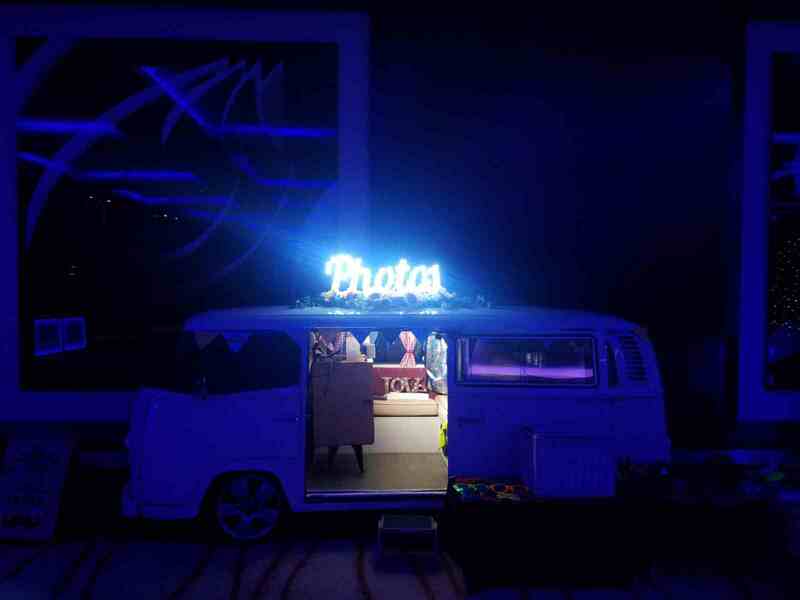 Are you planning a corporate hospitality event and need a campervan photobooth? We would love to hear about your corporate hospitality event plans – and any campervan photobooth requirements you might have. Don’t be put off by your venue being indoors – we can work with you to gain access approval from the venue and make sure that everything is set up to be compliant with their guidelines. We have a fleet of six pretty campervan photobooths. 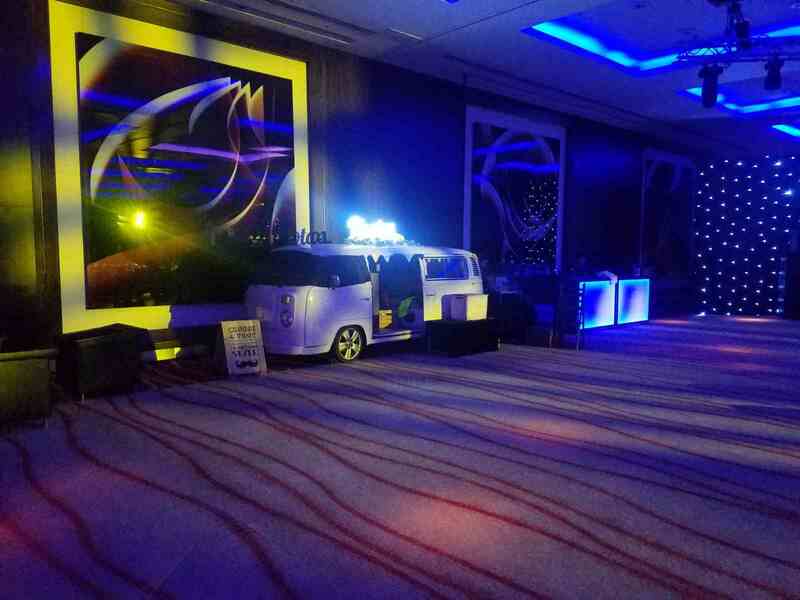 We can customise our services to meet your event’s unique requirements, and can even apply branding to our vehicle bodywork.